Recently launched is shorelineobx.com, the Outer Banks Vacation Rental Management Company belonging to Shoreline Preferred Properties.. The website, developed by InterCoastal Net Designs, utilizes the Escapia Booking Engine Integration as well as a custom designed Content Management System. 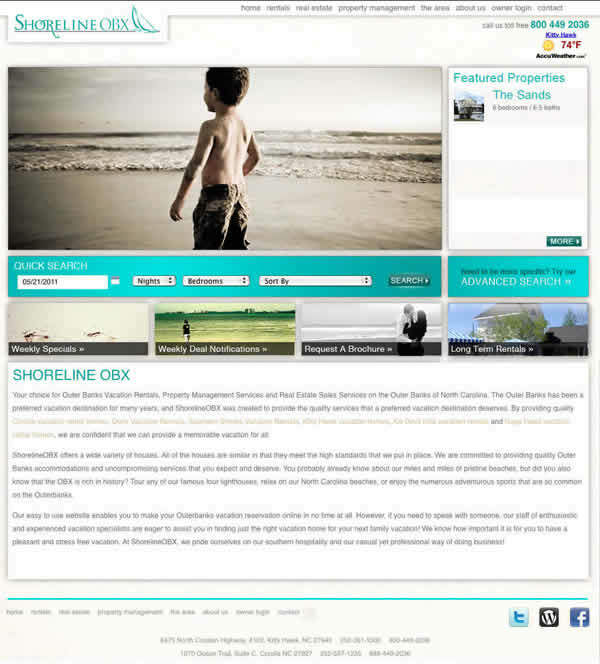 As part of their internet marketing strategy going forward shorelineobx.com has signed on for SEO services with ICND. Shoreline Preferred Properties has been in business since 2004 and has locations in both Kitty Hawk, NC, and Corolla, NC.